Low pressure air compressor Quincy QSLP 10-200 hp is designed to deliver 25-40 psig with maximum energy efficiency, perfectly suited for low-pressure applications. Not only does it cost less to buy and install a QSLP, but it continues to pay you back with every hour of installation. Quincy QSLP rotary screw compressor is perfectly suited for low-pressure industrial application. This low pressure air compressor is a good alternative for rotary vane compressor and oil-free and two-stage compressors. Designed especially to deliver 25-40 psig with maximum energy efficiency. The QSLP uses between 10% and 25% less energy than similar units. Not only does it cost less to buy and install a QSLP, but it continues to pay you back with every hour of installation. A key QSLP low-pressure air compressor has a remarkably efficient and durable airend. Equipped with individually shaped and profiled rotors, the airend is designed to deliver maximum performance and an extended lifespan. The robust drive motor turns the male drive, which then turns the female drive — no gears are required. There’s also an expertly designed and engineered positive displacement pump that is driven off the rotor shaft, which enables lubrication to commence immediately upon compressor activation. Another QSLP low-pressure compressor highlight is the Quincy-designed modulating inlet valve. The valve automatically opens when demand increases, which enables the compressor to take in more air. The inlet valve then closes when demand drops. The end result is that your compressor will always maintain a steady, consistent operating pressure. There’s also an auto-dual function that shuts down the drive motor when demand ceases and automatically restarts the motor when demand ramps up again. 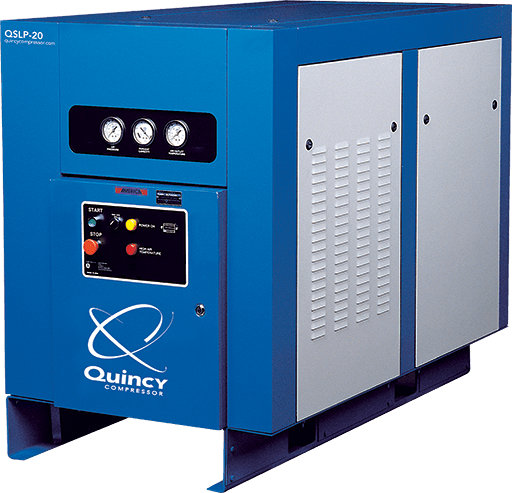 The Quincy QSLP low-pressure air compressor also includes an advanced electrical control panel with full instrumentation that enables comprehensive monitoring of the pump and other vital compressor processes. Key panel features include an hour meter, discharge air/fluid temperature gauge, reservoir air pressure gauge and fluid filter pressure differential gauge. Your Quincy QSLP low-pressure compressor includes a specially designed inlet air filter that prevents dirt and airborne contaminants from reaching compressor components and causing damage or premature wear. The filter element is capable of trapping particles as small as 10 microns. Severe-duty filtration packages are also available for use in high debris and contaminant operating environments. Quincy offers a variety of warranty plans with the QSLP for your protection and peace of mind. You enjoy a five-year warranty that is among the best in the industry. Unlike other compressor manufacturers’ warranties, Quincy warranties do not require you to enter into a binding — and costly — service contract.